These silver bullion bars are made by Johnson Matthey, a refiner that has been in business since 1817. Renowned the world over for the quality of their products and the reputation that has endured for nearly 200 years. 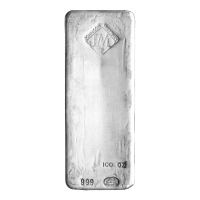 Johnson Matthey Bars are 999 Fine Silver, poured in a loaf shape with lots of character (cooling marks and ripples), and weigh at least 100 Troy ounces. If you are looking to buy silver in quantity, this is one of the most economical ways to do so. גוש כסף Johnson Matthey משקל מאה אונקיות These silver bullion bars are made by Johnson Matthey, a refiner that has been in business since 1817. Renowned the world over for the quality of their products and the reputation that has endured for nearly 200 years. Johnson Matthey Bars are 999 Fine Silver, poured in a loaf shape with lots of character (cooling marks and ripples), and weigh at least 100 Troy ounces. If you are looking to buy silver in quantity, this is one of the most economical ways to do so.